We know choosing the perfect wedding cake may seem like a daunting task, but don’t let those walls of frosting scare you. With some proper “research” (aka tasting) and smart planning, you too can pick a glorious pile of pastry for your wedding! Luckily for you, we have a list of some helpful tips to get you started – just some golden nuggets of information to give you and your guests a delightful dessert experience. The first step to choosing your perfect wedding cake – finalize your guest list. Yes, you read that correctly. You don’t need to be dipping your finger in icing if you don’t know how many guests you’re going to be serving. This first step is crucial in deciding how tall (or wide) your cake needs to be. Two tiers? Three tiers? Who knows, unless you tally up the guest list. Typically a two-tier cake can feed 50 to 100 guests, and a three-tier cake can feed 150 to 250 guests. If you’re looking to have more than 300 guests, prepare for a mountain of a cake – we’re talking up to five tiers! Need some inspiration for your perfect wedding cake? 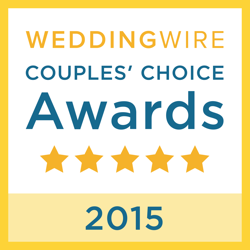 Think about the venue, the menu, and your wedding’s overall style. It doesn’t have to be so matchy-matchy, but do take into consideration your wedding’s theme. Before choosing your baker, do a little bit of recon. Check out their social media, website, and get an idea of their style. It’s important to pick a baker that lines up with your wedding’s style and can come up with a beautiful cake to go along with your theme. WeddingWire has a fantastic tool if you’d like to check out different cake artists and their portfolios. It’s time to do your homework! 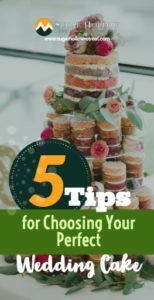 Before you can choose what flavor you want your perfect wedding cake to be – let’s cancel out all the flavors you know you DON’T want. If you hate red velvet, or buttercream isn’t your thing, let the baker know. It’s better to come into your baker’s office with a general idea of your preferred flavored and style than to go in and taste every morsel in sight. You don’t have to carry all the pressure of picking a perfect wedding cake. Bring someone along for the ride – preferably someone with the same desire to create an awesome wedding. Pick someone who’s going to be helpful, rather than distracting. This is going to an important role, so you want someone who’s going to give feedback and positive opinions.